The Lana Double Layer Black Fox Fur Cape is a dramatic midnight design for her composed of a 100% polyester with layered authentic black fox fur trim. This elegant cape is full and full of personality! The unlined style is comfortable and cozy for the winter and fall months. Three hook and eye closures can be fit over your figure. This remarkable cape will accentuate any formal outfit from gowns to party dresses. 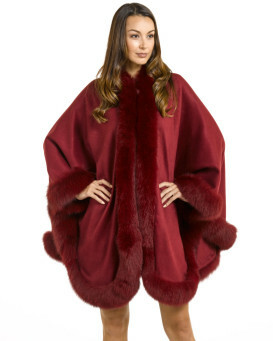 Imagine this stunning cape in contrast with the winter snow! This cool weather accessory is glam and festive for a romantic date or a chic winter party. "Kentucky weather has its own mind, often with overlap between coats and spring Derby fashion. This cape is an easy go-to for a layer of added warmth without the bulk of a winter coat. I highly recommend it not just as a "story piece," but as a versatile asset to your wardrobe." "I have not used my new cape yet. I am taking in to NY for New Years Eve. I love it."